The apple hung tantalizingly out of reach, a single perfect specimen suspended high in the upper reaches of the tree. I had just started picking our Black Amish apples and was delighted to discover this remarkable fruit, hanging heavy with temptation and silhouetted sharply against the open sky. 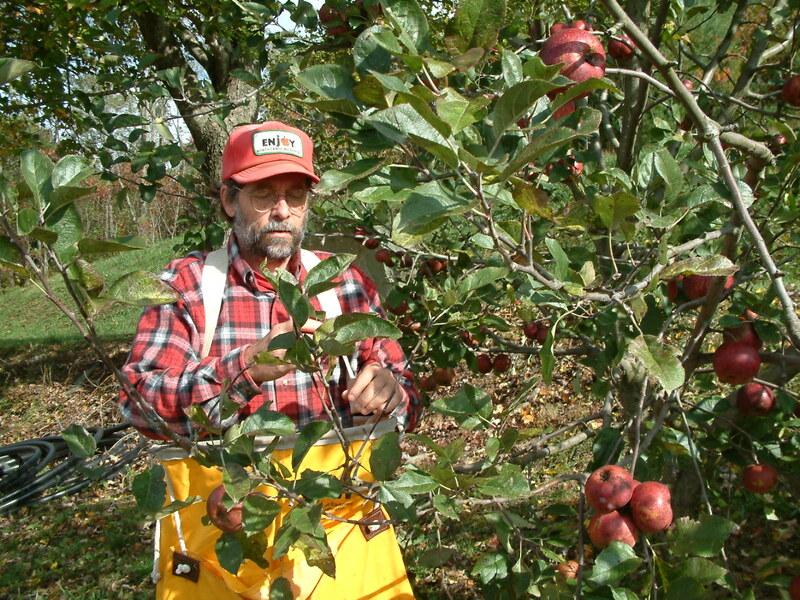 I began harvesting all the fruit within reach from the ground, methodically filling my picking bag, all the while keeping a watchful eye on that picture-perfect apple. I picked all the easy-to-reach apples and quickly turned my attention to the star at the top of the tree. It was just beyond the grasp of my 12’ pole picker and situated at such an awkward angle that using my harvest ladder on the sloping hillside would be a highly risky venture. Besides, with the instabilities of my Parkinson’s disease, I was not entirely comfortable with the prospect of crawling up a shaky ladder, perching precariously on the top rung and struggling at a dangerous angle to reach out to grab an apple, no matter how perfect it might be. The only option was the pole picker. Taking up the long, wooden pole and standing on tiptoes, I poked upwards at the apple hoping to trap it safely in the small wire basket before it fell to the ground. Again, I came up short and could just barely brush the bottom of the apple with the apple. I had to be very careful and deliberate. This was a very fine apple and I did not want to dislodge it too quickly and have it plunge to the ground and become bruised and unsellable. This was the type of quality, extra-attractive apple that I liked to put on the top of the bushel basket to catch the eye of the beholder. So, determined to have this apple in-hand, I leaped upward, and with my right hand, thrust the pole picker toward the elusive fruit with the notion of grabbing it quickly in the wire basket. I missed. In dismay, I saw the pole hit the bottom of the apple and watched in slow motion horror as the heavy fruit severed itself from the high branch and began falling. Without thinking, I instinctively shot my left hand forward and with dazzling speed and agility, neatly snared the apple in mid-flight! With the fruit firmly in grip, I held the fresh prize close and admired its rich, dark red beauty. It was indeed a picture-perfect apple, firm and round with an alluring floral aroma. I held the apple close to my nose and breathed deeply, savoring the pure “apple-ness” of this red jewel. Then, with no hesitation, I bit deeply, savoring the explosion of juice and flavor that momentarily overwhelmed my senses. No, this apple would not adorn the top of the bushel basket this day. Another attractive apple would have to fill this position. 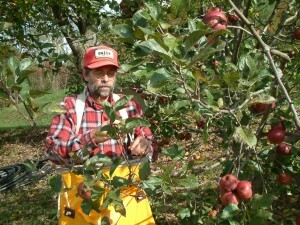 At this moment this particular apple was the picker’s prize and I had earned every sumptuous bite. It’s the first day of November at Big Horse Creek Farm and winter has roared in with great force and bluster. Four days ago we were enjoying a beautiful late fall day with temperatures in the low 70’s and clear, sunny skies. Weather conditions today are so dramatically different as to leave the mind spinning in disbelief! Right now, as I sit warm and dry by the woodstove, it’s 32 degrees outside with a fierce northwest wind gusting to 35-40 miles per hour. The apple trees in the orchards, still holding on to most of their late fall foliage, are engulfed in five inches of heavy, clinging snow, creating a weird image of row after row of grotesque, snow-covered statuary. This early winter blast probably signals the end of the fall harvest season. There are a few Yates and a couple of Limbertwig trees still remaining, but everything else has been picked and sold. This year’s apple crop, along with our stock of nursery trees, was significantly reduced this season due to the effects of foul weather that have plagued us since mid-winter of last year. The brutal cold of the winter of 2013-2014 laid waste to our young, overwintering apple trees, destroying more than 1000 trees we thought had been safely put to bed in the nursery last fall. The winter assault continued into spring when a late freeze over three days in mid-April devastated the annual bloom, leaving us with 50% of a full crop. We rationalized our losses by accepting the fact that half a crop was better than no crop! Farmers become very adept at rationalizing as they deal with constant loss and setbacks; it’s just the nature of our business. Success is often elusive as disappointment seems to be the ruling norm in far too many circumstances. Rationalizing becomes a survival mechanism for farmers, a way to deal with the misfortunes, delays and obstructions arrayed against them in their pursuit of perfection in their work. Achieving the ideal is never meant to be an end in itself. It’s simply a goal, an objective, an aspiration that can never be fulfilled but one for which we strive, nonetheless. It’s basic human nature to struggle against overwhelming odds with the recognition that it’s the passion of the struggle itself that becomes the real measure of our success. As individuals we may never reach our own lofty goals but we can take comfort in our unending efforts for success. As we enter the final weeks of 2014 with an eye toward next season, I will not necessarily look back with disappointment or bitterness over our losses this year. There have certainly been worse seasons over the last 30 years that put everything in proper perspective. Of course, we can hope 2015 will be more favorable and productive but, if not, then we’ll just deal with whatever negative issues might arise. In the meantime, we’ll continue our work and do those things, however small or insignificant, we think will help ensure greater success in the New Year. In January we’ll bundle up warmly and go out in the bitter winter cold to prune our trees. Come springtime we’ll gather cuttings and begin grafting trees for fall planting. We’ll take care of the chickens, tend the garden, spray the trees and keep the garlic beds weeded as best we can. We’ll do all this with expectations and hopes for great success while maintaining a sober mindset that a single cold night next spring could bring all these expectations to a crashing end. We will be satisfied knowing that we did all that was possible to make it all work. In the end, that’s about the best one can do. Organic Management Program, Should not mean a spraying schedule. “Spray”, can have many different meanings Martha. One might consider restraint over knee-jerk negative conclusions.